Public assessments of the Supreme Court have reached a quarter-century low. Unlike evaluations over much of the past decade, there is very little partisan divide. The court receives relatively low favorable ratings from Republicans, Democrats and independents alike. Republican ratings fell steeply between 2009 and 2010, with the appointments of Sonia Sotomayor and Elena Kagan to the court. Democratic ratings remained relatively high through 2010, but have fallen steeply since. The weak ratings for the court across party lines stands in contrast to most previous polls, in which those in the president’s party have viewed the Supreme Court more favorably than those in the opposite party. Most recently, throughout George W. Bush’s administration, Republicans felt much more favorably toward the Supreme Court than did Democrats. 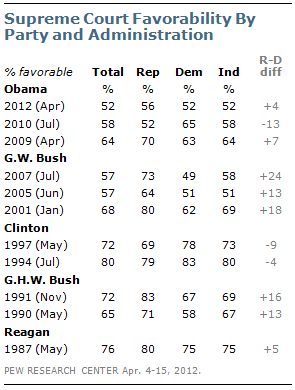 In July 2007, 73% of Republicans rated the court favorably, compared with 49% of Democrats. This divide began even before Bush took office, triggered by the Supreme Court’s Bush v. Gore ruling. In early January 2001, 80% of Republicans viewed the court favorably, compared with 62% of Democrats. 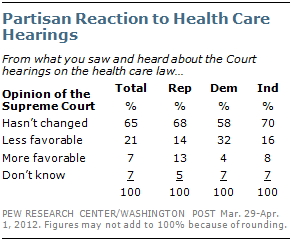 The survey was conducted after the Supreme Court’s hearings on the 2010 health care law. It finds that the law’s supporters and opponents express similar views of the court. 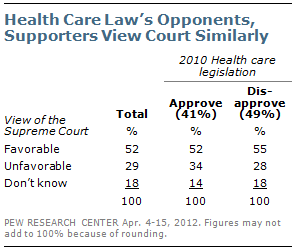 Overall, the public remains deeply divided over the health care law: 41% say they approve of it, while 49% disapprove. Among the bill’s supporters, 52% have a favorable view of the Supreme Court, while 34% view it unfavorably. Among the bill’s opponents, the balance is only slightly less negative; 55% favorable, 28% unfavorable. However, a survey conducted last month found that while most Americans said the health care hearings did not change their views of the court, Democrats were far more likely than Republicans to say their opinions of the court had become less favorable. The survey by the Pew Research Center for the People & the Press and The Washington Post, conducted March 29-April 1, 2012 among 1,000 adults, found that 32% of Democrats said their opinion of the court had become less favorable as a result of the hearings on the health care law; just 16% of independents and 14% of Republicans said their views of the court had become less favorable.